Home > Travel guide > Do you want to fly on the Cang Chai? 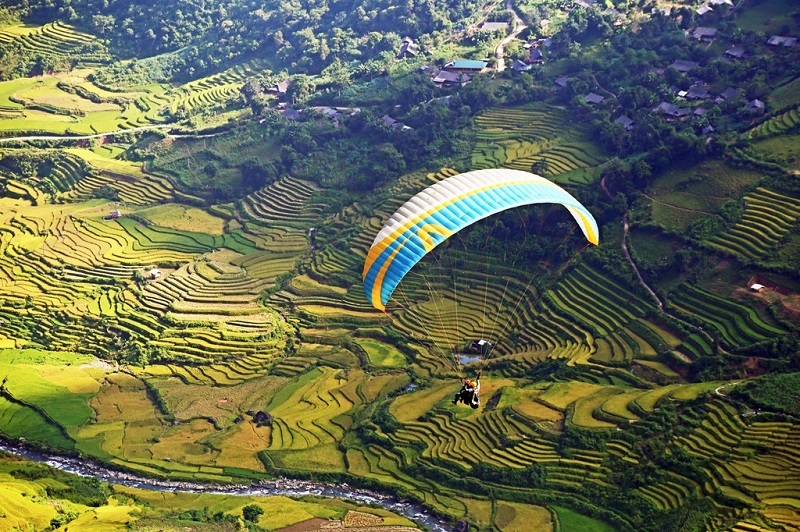 Paragliding is one of activities for visitors to discover the full beauty of terraces in Mu Cang Chai district, Yen Bai province. Flights start in a sea of clouds at the peak of the Khau Phạ Mountain, located about 1,200m above sea level. Visitors can expect to make creative costumes with pilots and local residents. Creators of the six best costumes will win the opportunity to join a flight over the fields, which festival organisers say are the most beautiful of their kind in Việt Nam. Mù Cang Chải has 500 hectares of rice terraces, cultivated for centuries by the Mông ethnic minority people in La Pán Tẩn, Chế Cu Nha and Dế Xu Phình communes. Local terraces are among the 2,500 hectares recognised as a national heritage site in 2007 by the Ministry of Culture, Sports and Tourism. The area’s elevation makes farming methods from delta regions impossible to execute. The terraced fields make the most of the water supply by preventing it from flowing downhill. The area is beautiful all year round. In March, the unplanted ponds glitter. Locals plant rice seedlings from April to May. After May, the green hills nurture their crop until the fields start to turn yellow with ripe rice in early September. During the harvest in October, the golden rice fields stand out amidst green forests. The festival’s first edition in 2013 attracted over 30 pilots and 1,000 spectators. The number of visitors has soared in recent years, up to 14,000 in 2017. There could be as many as 16,000 tourists this year.